I know I’ve been singing this song for a long time, y’all, but it’s bad, bad, bad and getting worse. Five years later, we have a much clearer idea of exactly what is happening, and it’s very bad news. The pesticide is embedded in the seeds. I posted to another piece on this topic this last week, and these are just a couple of the many anxious reports I’ve picked up on my bee wire (Google Alerts, when they’re working) in the past few months. I know I’m probably preaching to the choir here, but I implore you to read up on this issue, if you haven’t yet, and to spread the word far and wide. If we lose the bees, we lose the world as we know it. Oh, bees, I didn’t think I could love you more than I already do. 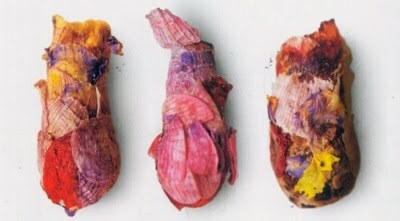 Via Light reading: Osmia avosetta bees make petal-nests for their larvae. 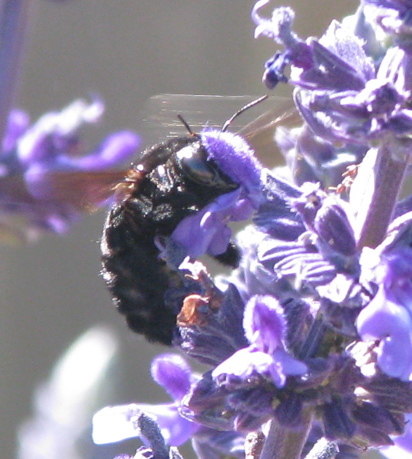 What appears to be part of a spring wedding bouquet is actually a nest for a rare species of solitary bee, a new study says. Although O. avosetta was known to science, no one had ever had a chance to study its behaviors. 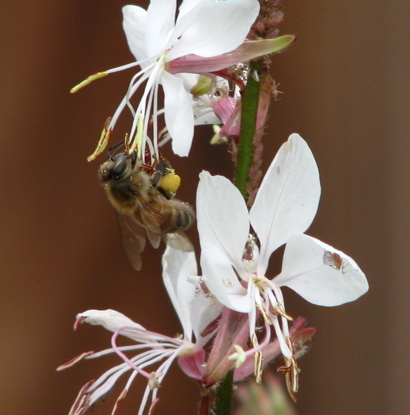 Bees don’t advertise their nests, Rozen said, and this species is only active for about two months out of the year. But in a lucky coincidence, two teams in two different countries discovered the nest-building habits on the same day. 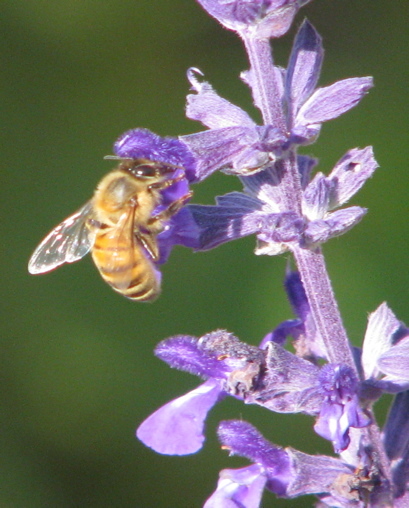 Rozen was working with a team of entomologists in Turkey last May, while another team was studying the bees in Iran. The groups collaborated on a recent paper published in American Museum Novitates. “It was absolute synchronicity that we all discovered this uncommon behavior on the same day,” says Jerome Rozen, curator in the Division of Invertebrate Zoology at the American Museum of Natural History. Rozen and colleagues were working near Antalya, Turkey while another group of researchers were in the field in Fars Province, Iran. 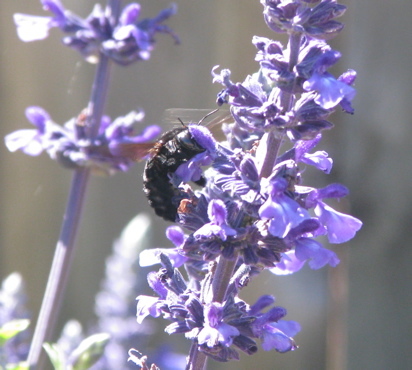 This site has a photo of a bee carrying a petal to the nest, but it’s too small to make out much. I would love to see video of how the bees manage this feat. …all my photos look the same. 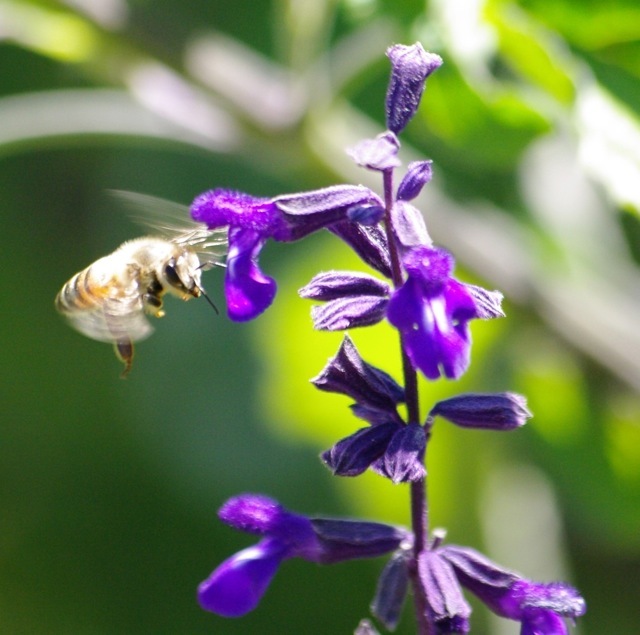 Same salvia, same bees, same blur. Can’t be helped. 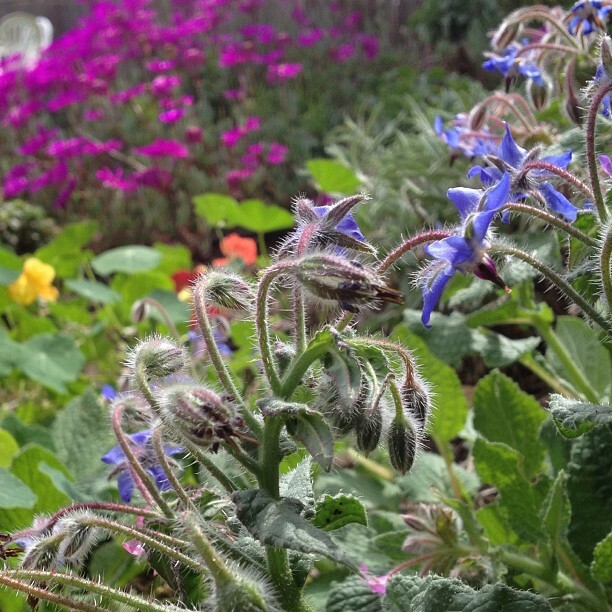 I am powerless to resist those blues, those greens, those coppery wings, this pointed face buried in blossom. 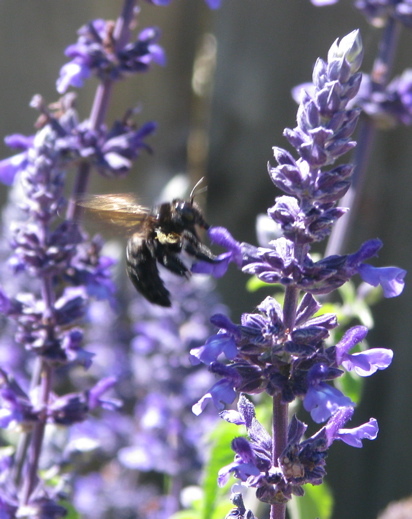 It has been troubling me in a quiet way that I’ve not seen many bees in the garden this spring: an occasional lone native bee, one carpenter bee, and that’s it. But just now I checked my archives and I see I was worried about the same thing in late April last year. 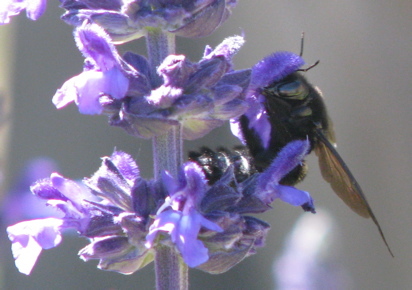 The carpenter bee appeared in early May, and it wasn’t until mid-May that the honeybees began to dominate my posts and pictures. I did have sunflowers blooming last April, but the birds had planted those in February: overspill from the feeder. 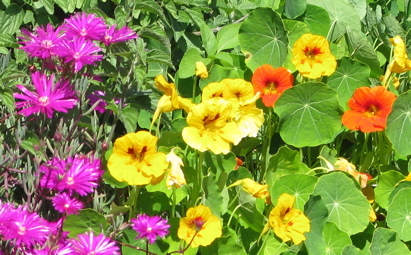 This year the feeder is in a different spot, shadier, unwatered, and I had to plant the sunflowers myself. They’re coming up nicely, taller now than Wonderboy, not as tall as Beanie. 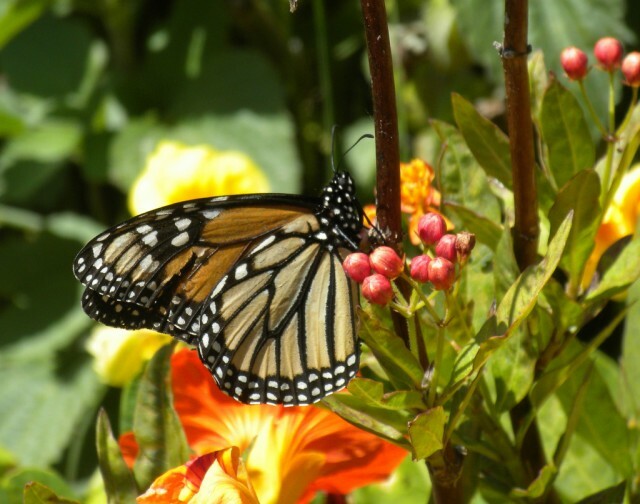 The Monarchs arrived in late May, not long after I planted my anniversary milkweed. The milkweed is blooming nicely now, despite hordes of yellow aphids, but we’ve seen no trace of caterpillar nor butterfly yet. Also in bloom: pincushion flower (just barely), nasturtiums galore, enough sweet alyssum to supply Rilla with endless bridal bouquets for her daily weddings, geraniums in red and pink, cornflowers, bougainvillea, ice plants in red and white and magenta, snapdragons, brown-eyed susans, thyme (whoops), cilantro (whoops), the cooking sage (whoops), and the other kind of salvia, loads of it, waiting for the bees. Goldfinches, bushtits, purple finches, sparrows, hummingbirds, a phoebe, and the marvelous crows: our April birds. We saw a scrub jay on the sidewalk today, a block from home. I love jays, the cheeky, arrogant things. I wish they’d visit our yard more often. The Hidden World of Eloise: The designer apologises – How Twitter helped an artist protect her copyright. Social media WIN! 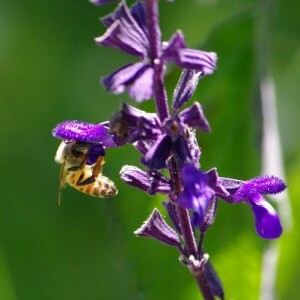 In Appalachia, a Researcher Makes Honey From Coal – Faculty – The Chronicle of Higher Education – “Her vision is to create nothing less than an Appalachian “honey corridor” in eastern Kentucky and neighboring West Virginia, starting with more than 33,000 surface-mined acres, which could be reforested in a way that sets up a bee industry.” HT: Monica @ small things—thanks so much for sending this my way! Who Is Mark Twain? by Mark Twain – Oooh, a TBR pile topper for sure.